Free Peruvian food will be served! Can an entire nation be represented by its cuisine? 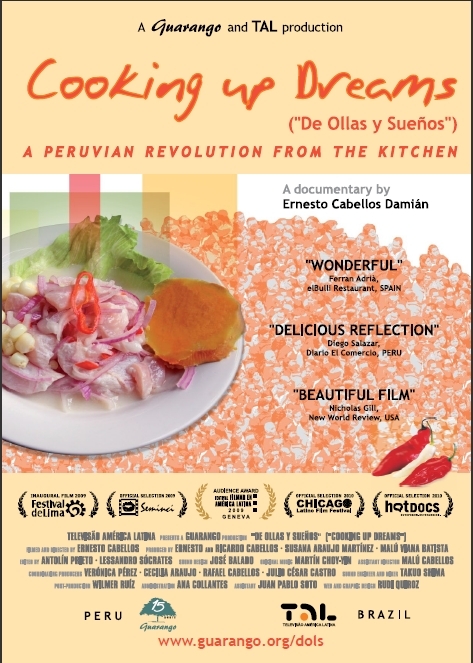 This documentary journeys to the kitchens of Peru’s coast, highlands and jungle, as well as Peruvian expat communities in Paris, London, Amsterdam and New York for answers. From the most humble family kitchens to the poshest restaurants, from stories of pioneering Peruvian chefs abroad to those who preserve ancient recipes at home, we find that Peru’s cuisine is a deliciously integrating for its people, who have historically been marked by ethnic and economic differences. Cooking Up Dreams (Trailer) from Guarango Film & Video on Vimeo.